Alain considers himself blessed and humbled to work as a Stress Management Coach. If it were not for people who, like you, are searching for a natural way to alleviate and neutralize stress, he would not be able to engage in the work he does. So with that, he voices a big, heartfelt �? ?Thank you,�?� to all those he has worked with and to those he is soon to work with. Alain�? ?s expertise did not come overnight, nor was it a pain free process. In his younger years, he kept to himself and was usually introverted. As an overweight, insecure, and low self-esteemed individual who could hardly maintain conversations and look people in the eye, Alain struggled to connect with people and often felt crippled. He longed for the day when he would feel comfortable within his own skin and feel a sense of belonging. As he took on the task of overcoming his self-critic and self-doubt, he began to witness improvements within his life and his connectedness with people. To the onlooker, the changes were perhaps unnoticeable, but within, these shifts were profoundly monumental to him. The more and more he worked and developed a relationship with his emotions, the more he experienced growth. He realized very quickly, there could be no gimmicks or short cuts. If they were used, they were only a patch to hide behind. Alain successfully moved through these looming sticking points of his life, finding himself leading workshops and coaching private clients as a successful Relationship and Social Interaction Coach. Not satisfied with being obese, Alain extensively studied nutrition and holistic living. Through an arduous process of self-healing, Alain elected to switch to an Alkaline Lifestyle. He added a regular exercise routine and most importantly, initiated a healthier relationship with his emotional eating habits. Combined, Alain was able to successfully shed 52 pounds. Six years since, he has coached others to do the same, has kept the pounds off, and has become much healthier in every way. It�? ?s interesting to note that the National Institutes of Health and other studies show that 95-98% of people who lose weight gain it back within five years. Only 2-5% of dieters succeed in keeping their weight off. 90% of those gain back more weight than they lost. Knowing this, he credits his ability to not look to food to make him feel better when he was/is stressed. Despite what some people think, even if you eat the healthiest food on the planet, you can gain weight when you overeat. Alain�? ?s Stopping Emotional Eating Program is very popular and holds much significance to him. 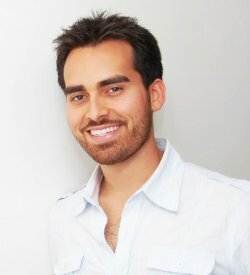 Originally from Los Angeles, California, Alain now resides in San Diego, California with his beloved partner, Xochitl. Following his life path has given him the abundance to empower people, pursue his love of travel, work through his fear of singing in front of an audience, and eat lots of yummy, healthy food! Alain�? ?s weakness is warm, homemade chocolate chip cookies. Yes, its definitely a comfort food. Alain works on his stress triggers, as they arise and on the spot; it is very empowering to have a proven system to work through these bubbling emotions. After all, stress never ceases, we can only change the way we react to it. A single shift in emotion releases a cascade of 1,400 bio-chemicals. This can either be health promoting or dis-ease forming. This is the topic of many of his empowering, educational, and interactive public talks in the local area. Its now your turn to decide how your body reacts to stress. You do have the power, you need only decide to learn how to use it. What will you do? This is a perfect way to transition from mind living and identification with forms to unity consciousness. Still waiting on some of the things i created to manifest, but that process is very exciting. I would like to become a teacher once I am comfortable and readily able to transition into unity consciousness. Living in the high vibration of my heart is making the process of 'watching thoughts' very easy. I am loving combining the meditation methods from the workshop with neurofeedback. I find that my focus, love, and intelligence are much better with the tip of the toungue stimulation as presented in the workshop!